When you write a policy, you probably do so because someone somewhere wants to manage risk and protect the people it’s aimed at. Despite this noble intent, many flinch when a new policy is announced because they think that yet another cherished freedom is under attack. It doesn’t have to be this way. Policies can empower. They can liberate. They can enrich. And they can make you feel a whole lot better. That’s because they tend to provide clarity around what is acceptable and what isn’t. This clarity removes doubt and fear that can otherwise stifle an individual’s personal and professional development as well as cripple the organisations they work for, by blocking innovation and collaboration, and encouraging risk aversion, inertia and even withdrawal. 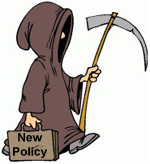 To be effective a policy has to make sense and land well with the intended audience. The ‘what’s in it for me’ question must be addressed right up front. “Failure to comply with this policy could lead to disciplinary action, including dismissal” just doesn’t cut the mustard. That’s a bit like telling people they are lucky to have a job when they submit an idea to improve the conditions they work in. With words like ‘compliance’, ‘discipline’, ‘conflict’, ‘declaration’, ‘grievance’, ‘enforcement’, ‘monitoring’ and ‘unauthorised’, the language around policies is littered with negativity. I promise you there’s at least a glimmer of positivity in every policy and a shed load in most, so stop focussing on the doom and gloom and bring out the positives. Demonstrate how the policy will liberate you to get out there and sell more stuff, build better products, provide even better support to your customers and even maybe encourage you to evangelise about the great company you work for. Given that most policies fly out of Legal, Finance, Internal Audit and HR it may be too much to expect the language within to ensure a smooth landing with the intended audience. This is where Internal Communications should take over the controls, ease back on the throttle, and bring the plane in safely. The next question is do they really have to be so damned prescriptive?